It’s easy to redeem your London Wine Academy gift vouchers. and it will give you the option to select a suitable course date. Received a voucher as a gift? below to help get you on your way. Your voucher is valid for 12 months and the expiry date is on the bottom left of your voucher. Can my Gift Voucher be extended? No, please make sure you enrol and attend your course before the expiry date. 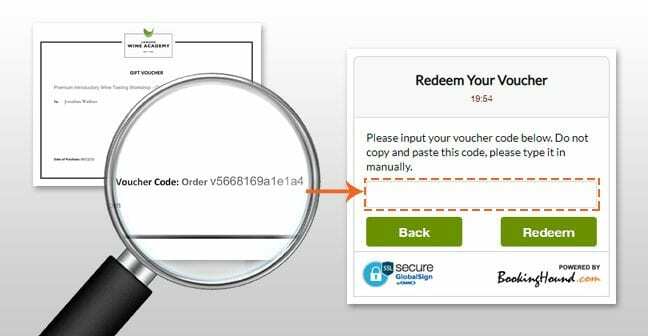 Type your voucher code into the Green Redeem Voucher Button on either the home page or on the course page of your choice. Follow the easy check out steps. Can I change the Course Type of my voucher? Yes, just email us your code and we would be happy to change it to a monetary value, so you can use it against any of our courses. I would like to book a second place, how does that work? Step 2: Then select the number of tickets you require. How do I know which courses I can attend with my voucher? Please have a look at the name of the course on your voucher. Visit the Course Page for a list of corresponding courses on offer.